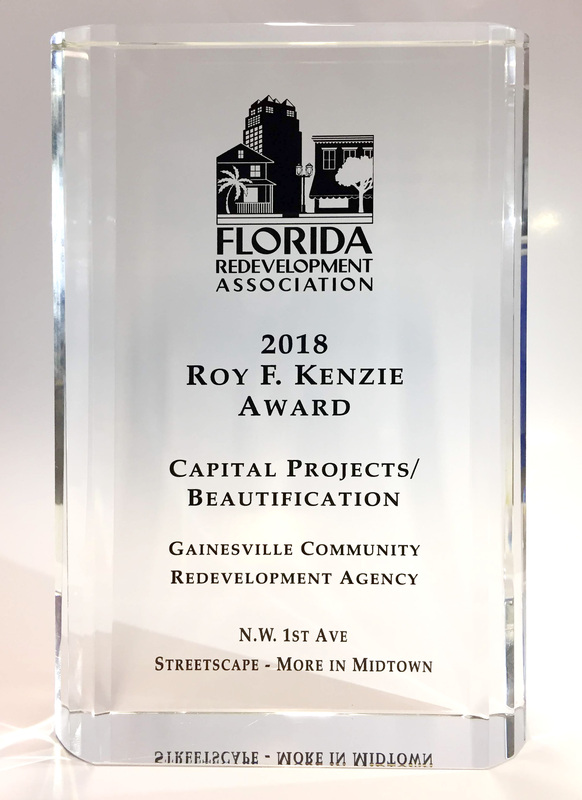 The NW 1st Ave Streetscape/More in Midtown initiative was selected to receive the Florida Redevelopment Association’s (FRA) Roy F. Kenzie award for Capital Projects/Beautification. Each year the FRA recognizes outstanding efforts by redevelopment agencies throughout the state. Winners demonstrate innovation and positive impact on their communities and inspire other Florida Communities. CRA staff accepted the award at the annual awards showcase on October 25th in Fort Myers. The Gainesville CRA led the $3.6M renovation of NW 1st Ave through two simultaneous capital projects. Phase one, beginning in January of 2017, consisted of the undergrounding of utilities and upgrading the water mains, through a partnership with Gainesville Regional Utilities. Phase two, completed in July of 2018, consisted of the redesign of the street. The goal of the project was to make the corridor safe and welcoming for the multiple users, from pedestrians to delivery trucks. 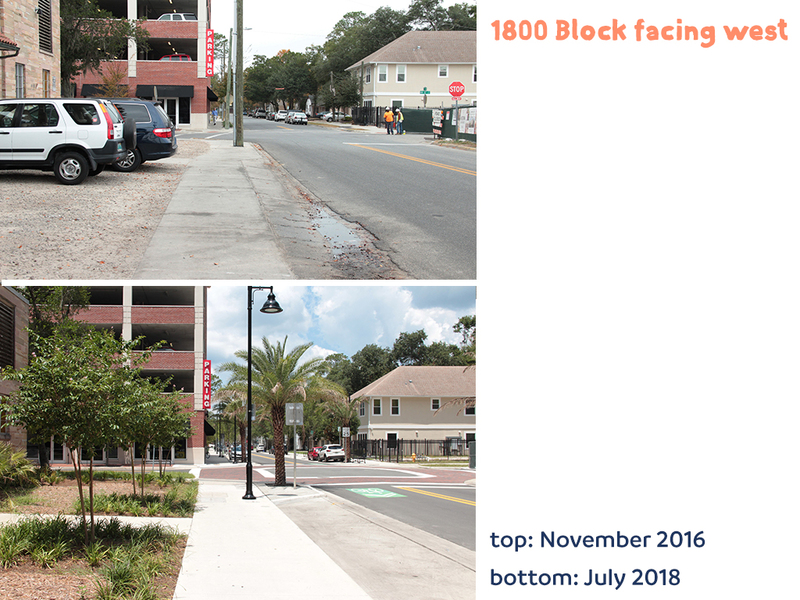 Updates included the addition of continuous sidewalks on both sides of the street, 46 newly planted shade trees, decorative lighting, bricked intersections, 55 car parking spaces, 110 scooter parking spaces, 7 loading zones, bicycle racks, trash and recycling receptacles, and street furnishings. An enhanced, targeted façade improvements program encouraged businesses along the corridor to take advantage of the construction and make their own improvements to their properties. The CRA leveraged $331K in tax increment funds to generate $615K in private funding. The result was just under $1M invested into local businesses along the corridor. For more information please contact CRA Project Manager Tricia Lopez at lopeztm@cityofgainesville.org or 352-393-8215.